Eight hundred years ago, American Indians bent an oak sapling over and tied it to the ground causing it to grow in that position. The reason they did this was to show the way to an important tribal location. This primitive example of wayfinding signage was simple but effective and shows that man has needed directions since the beginning of humankind. Long before modern times, humans needed markers and signs to find food and somewhere safe to shelter. Whilst the notion of marking the way has not changed, the techniques and tools certainly have. The City of Melton has recently rolled out 87 Arrow Alpha shared path wayfinding signs that are leading the way for cyclists, walkers and visitors. The signs contain maps highlighting the shared path networks, landmarks, destinations, walking and cycling routes, playgrounds, BBQ areas, services and amenities. The roll out of the signs coincided with the launch of the Avenza PDF Maps App. The App gives the user access to free digital maps showing various routes around the area. Simply download the Avenza PDF App to your iPhone, iPad or Android device and scan the QR code that is located on the wayfinding signs to load the App. 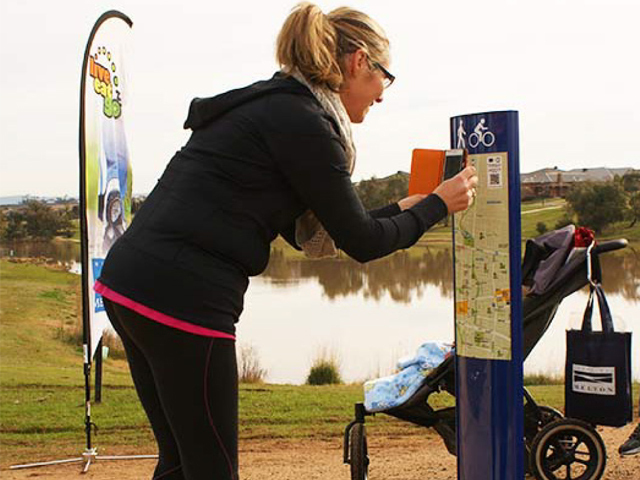 Melton City Council developed the App and installed the signs to encourage local residents to explore new areas and trails and promote a healthy lifestyle. With more and more people walking and cycling as a mode of transport and exercise there is an added environmental benefit with a reduction in the number of cars taking to the roads. Wayfinding signage is a necessity in today’s time poor society. It helps us form an image of an area whilst linking landmarks and precincts ultimately improving our ability to walk easily and safely between destinations. Over time man has developed more sophisticated and intricate ways to guide others and wayfinding signage has played a vital role in the history of civilisation by bringing suburbs, towns and cities to life whilst also nurturing a sense of community. Arrow Alpha’s team are thinkers, designers, problem solvers and inventors, always on the lookout for opportunities to create and manufacture innovative products for a sustainable tomorrow. By focusing on improving the eco-efficiency of manufacturing systems to reduce energy, water consumption and greenhouse gas emissions, production costs are also reduced, resulting in a win-win solution for our client and the environment.